Makati is known to have a lot of good restaurants so we were very excited to try out some of them. Our first stop was Lulu for dinner. We almost didn’t find it. We used Google Maps to locate it but the address it gave us was wrong. It turned out to be on the next street instead. Anyway, we found ourselves in Lulu in time before the dinner crowd came in. Ambience was great – lovely place for a date. They had an open kitchen design, so you can see your food being prepared and hear the chef calling out what dishes need to be done. Service was good, too. 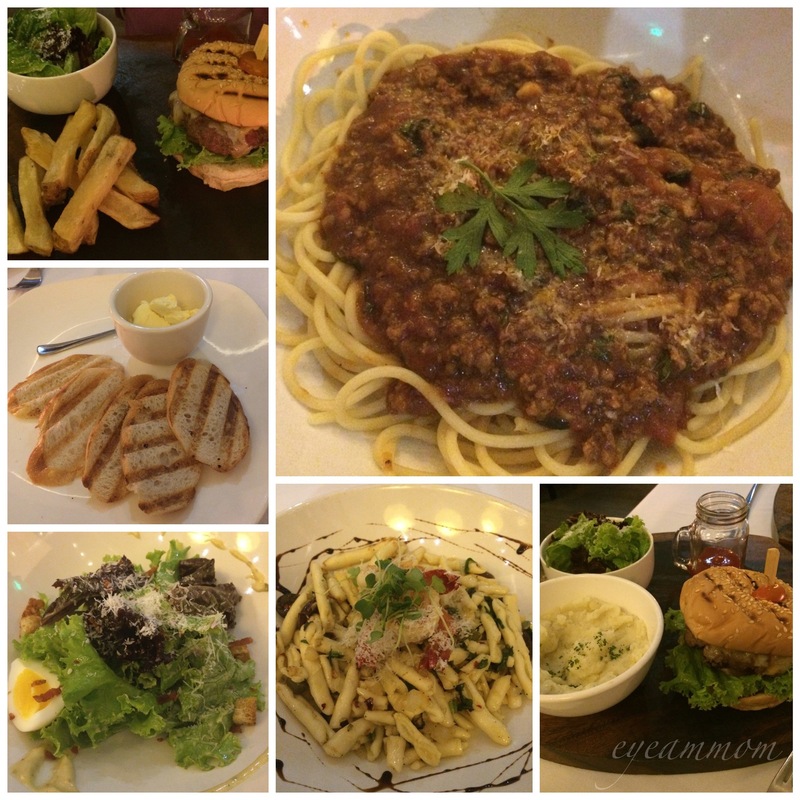 We ordered Caesar Salad, Lulu Burger, Lulu Pasta and the US Certified Angus Beef Bolognese. The bolognese was excellent, very tasty. The salad and the Lulu Pasta were mediocre, not bad but nothing great either. The burgers were disappointing. The center of the burgers were raw and the burgers had that raw taste. Not a very good way to end our day. For breakfast, we went to Pablo, which was located on the ground floor of the Picasso. We ordered the Bangus with Rice, Chicken Adobo Flakes with Rice and the Sardines in Oil with Rice. All these orders came with eggs the way you want them. From the buffet, you could get cereals, fruits, cheese, deli meat, salad, bread and fruit juices. Not too many choices in the buffet. We found the food to be of average taste. Serving size for the bangus and sardines were quite small. The adobo flakes had a burnt taste. Again, quite a disappointment. Later on that morning, we went to the Salcedo Saturday Market. What an interesting place! There were so many stalls to choose from, with a wide range of cuisine available. There were homecooked meals, specialty food, fresh produce, flowers, fresh fruits and vegetables. We would have wanted to buy some of those dishes but we didn’t have the proper storage to prevent spoiling. We did try out the ice cream. We were choosing between Carmen’s Best and Adam’s Seriously Good Ice Cream. Unfortunately, the flavors we wanted in Carmen’s Best had already been sold out. So we ended up with Adam. 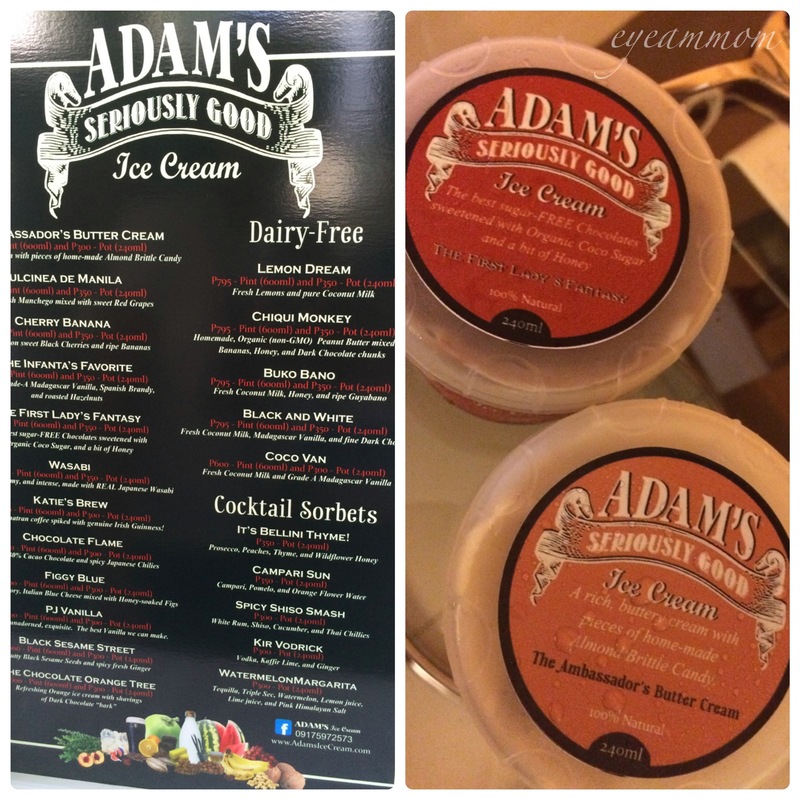 Adam’s Seriously Good Ice Cream was just that – seriously good! We had a hard time choosing which flavor to get. Adam was there to make the sales pitch (not that we needed any convincing). He explained how they make their ice cream, what makes them different, and how they use only the best ingredients for their ice cream. We got the First Lady’s Fantasy (“the best sugar-free chocolates sweetened with organic coco sugar and bit of honey”) and the Ambassador’s Butter Cream (“a rich buttery cream with pieces of home-made almond brittle candy”). Our last meal in Makati was at Bugsy’s Bar and Bistro. It was also walking distance from the Picasso. We had the Buffalo Wings, Buffalo Tenders, Bugsy Siegel and some mashed potatoes to go with them. The chicken was good – flavorful with just the right amount of spiciness. Not too oily, too, compared to other versions. The steak was okay, a little bland but still okay and reasonably priced too. It was large enough to split into two orders. The mashed potatoes were nothing great. This entry was posted in Family, Food, Life in the Metro, Vacation and tagged Adam's Seriously Good Ice Cream, Ambassador's Butter Cream, Bugsy's Bar and Bistro, First Lady's Fantasy, Lulu Restaurant, Makati, Pablo, Salcedo restaurants, Salcedo Saturday Market. Bookmark the permalink.